Sports is a multi-billion dollar industry in the United States that continues to grow. 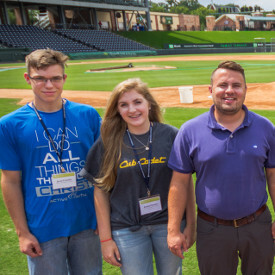 Sports management in particular offers a multitude of opportunities, from marketing to tournament directing, from media relations to facilities management. 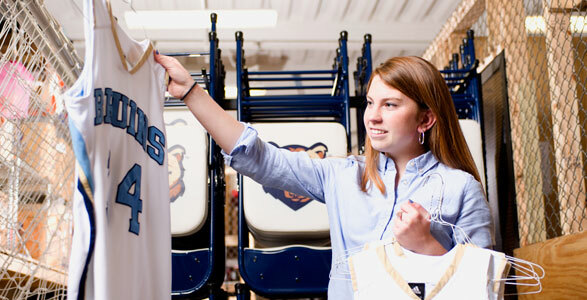 BJU’s well-rounded sports management program will prepare you to excel in your chosen arena. You’ll study coaching techniques and delve into the legal and ethical issues in sports. You’ll learn to apply the principles of business to the sports industry—all through the lens of a biblical worldview. 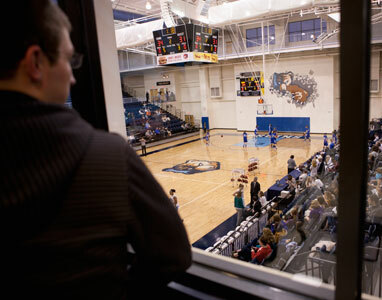 And you’ll put into practice what you learn through an 80-hour practicum in the sports management field. American sports is a $422 billion industry and growing. God provided a job for me at the Kroc Center after college. I work in the sports department with homeschool P.E., helped start a youth soccer league, and do sports camps with the kids on their break from school. I am also coaching at a volleyball academy. I’m so glad that God has given me two jobs I enjoy and love to do. The coaching/teaching sports classes I took at BJU prepared me to work with the kids; I know how to explain things so that they understand. Playing soccer for the Bruins allowed me to have a vast knowledge of the sport and pass that knowledge on to the younger kids. I think the most valuable part at BJU was the work ethic that the teachers taught. They encouraged us to be willing to do anything. They taught us that the job you want may not come easily. You will have to work hard for it, but if you do you will succeed. They also emphasized being open to new opportunities, and how the majors don’t just equip you for one thing, but a variety of avenues you can take within that major. Our sports management program gives you a solid foundation in various management positions and communication. In addition, plenty of hands-on experiences (including internship opportunities at businesses and colleges) will supplement what you learn in the classroom. You’ll coach, officiate, coordinate events, manage facilities—and that’s just the beginning. The faculty members will guide you through these activities from your very first one so that you’ll build confidence, expand your horizons and develop the ability to adapt and thrive in any professional situation that comes your way. In the sports management field, it’s essential for professionals to be able to communicate well with others. Through courses such as music, art, speech and literature, you’ll learn more about people with different backgrounds and values and how to connect professionally, effectively and graciously. And with courses in English, Bible and history, you’ll learn skills in critical thinking through analyzing, evaluating, and synthesizing information and ideas. What’s more, you’ll grow your knowledge of God’s Word and be better prepared to make a defense for the hope that is in you, with gentleness and respect. You can choose from a variety of electives that will prepare you for the future that God has for you. One option is to minor in coaching—the courses that you take will prepare you for coaching in schools and administering community and church recreation programs. These courses will also give you a solid foundation for camp ministry or for work on the mission field. Additionally, you’ll get some valuable experience through a coaching practicum. During your senior year, you’ll have opportunity to apply your knowledge and skills in a professional setting. You’ll choose from an area of study that interests you—such as sports organizations, event management and health and wellness—and then explore that field and learn valuable new skills. You’ll also develop professional contacts throughout this capstone experience, and gain 240 hours of excellent experience that will help you in your pursuit of graduate studies and job opportunities. 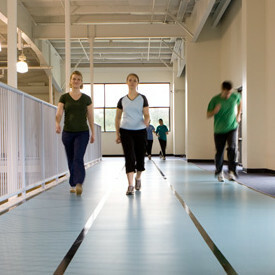 This 90,000 square-foot facility houses three college-sized basketball courts or four volleyball courts, a large swimming pool, an indoor running track (1/7 of a mile), a fitness center, classrooms and offices. 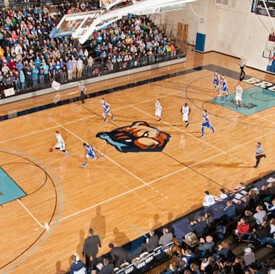 It can accommodate up to 4,000 spectators for the Bruins home games. 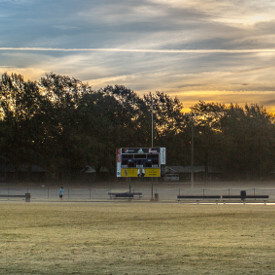 The athletic fields feature four soccer fields, a 1/4 mile track for competitive and recreational running, two sand outdoor volleyball courts and an activity pavillion that covers two outdoor basketball courts. 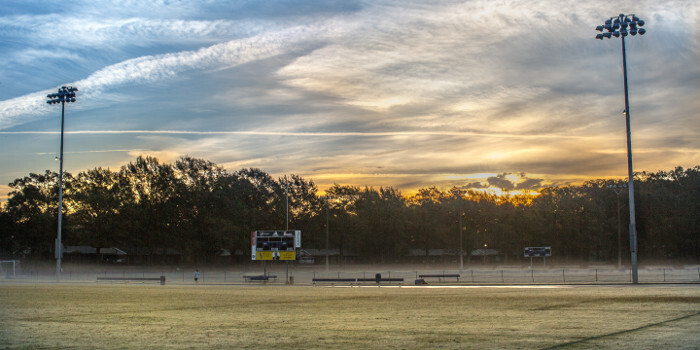 Alumni Stadium has a seating capacity of 4,500 spectators for Bruins home games. Tony Miller earned degrees in health, fitness, and recreation, secondary education and a doctorate in sports management. 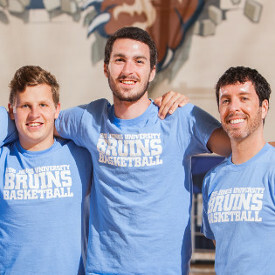 He is also the lifeguard manager and pool supervisor for the school’s aquatics facility as well as an assistant coach and director of basketball operations for the BJU Bruins men’s basketball team. Communicate a sport management philosophy based on a biblical worldview. Create a sport marketing plan. Apply legal and ethical concepts to sport management. Execute financial skills required in sport management. Experience supervised, meaningful work in a sport-related organization based upon his or her desired future career.